The water level in the marsh at Huntley Meadow Gardens here in Alexandria, VA has been getting lower and lower as the summer has progressed. I suspect that the situation had made it more difficult for some of the inhabitants to find food and may have increased competition for the available food. 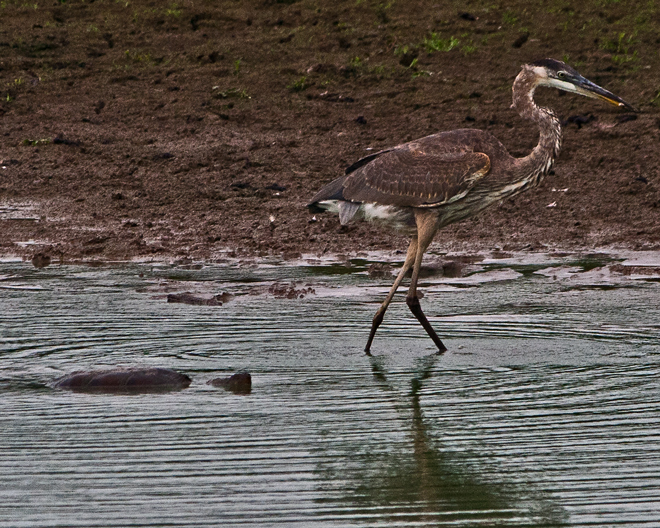 The heron eventually went back into the water and it wasn’t long before the snapping turtle came at him again. 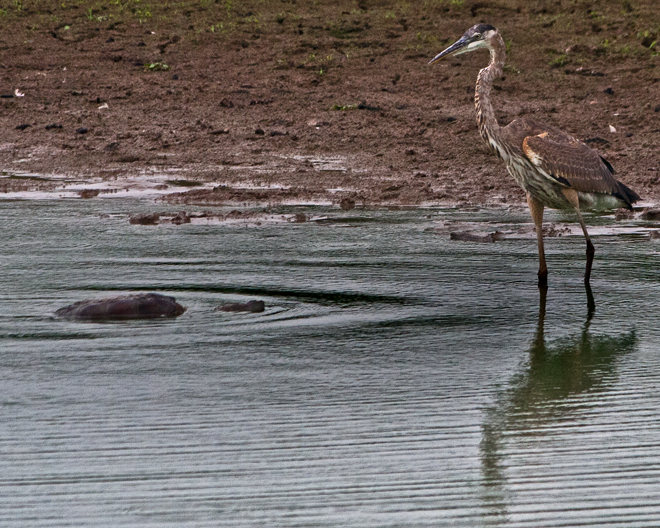 (I could almost hear the music of the movie “Jaws” in my head as the turtle made a run at the heron.) Like a matador side-stepping a charging bull, the heron awkwardly avoided the turtle who was approaching him faster than I’ve ever seen a turtle move. The heron then turned his back on the turtle and started walking away, perhaps feeling the hot breath of the turtle who continued to pursue him. 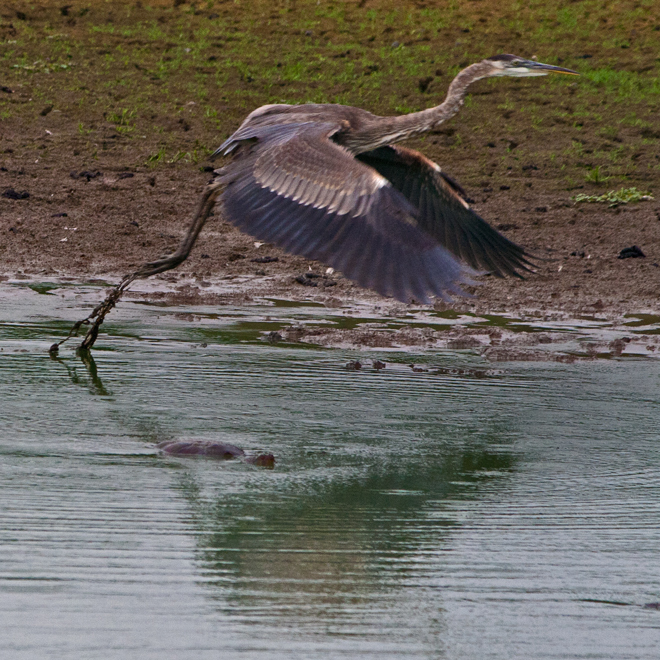 Finally, the heron took to the air, deciding that he had had enough of the persistent turtle. I managed to capture the highlights of the confrontation with my camera. I continue to marvel at the wonders of nature as I observe new creatures and see familiar ones act and interact in new ways. I just got back from shooting and couldn’t wait to post a photo of one of the coolest looking insects that I have ever seen. It appears to be be part of the grasshopper family, but its bright colors and blue eyes really made it stand out as I was walking through the marsh at Huntley Meadows Park this morning. I’m sure I’ll be able to identify him eventually, but want to share him now. Sometimes folks need a little extra pick-me-up on Fridays. 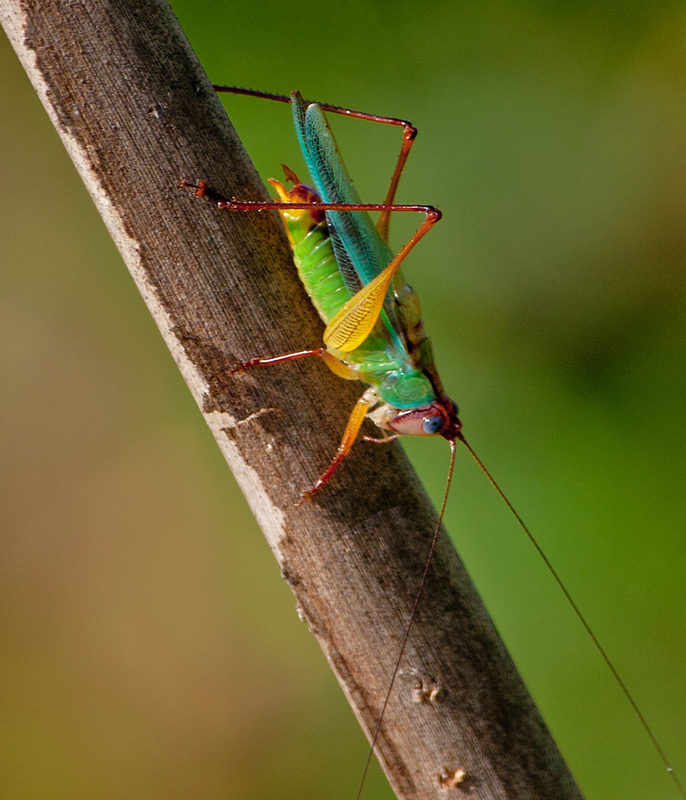 UPDATE: I am pretty sure he is a Handsome Meadow Katydid (Orchelimum pulchellum). I found a photo in BugGuide that looks quite a bit like this one. I was going through my recent dragonfly photos and this one really caught my eye. 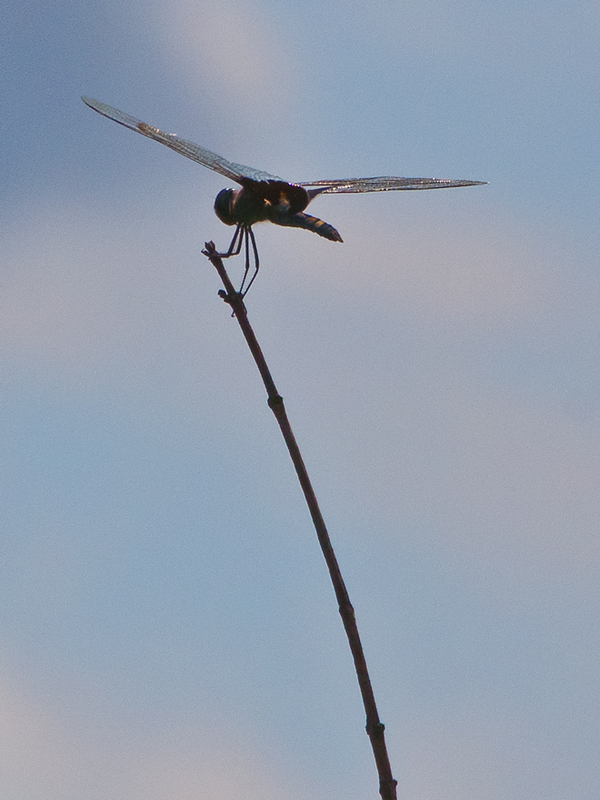 Somehow the combination of the dragonfly’s position and the long branch with the slight curve together made me think of a pole vaulter just before he clears the bar. It’s a little unusual that I photograph a dragonfly from below with the sky as a backdrop, but that’s what happened that day. Maybe he’s preparing for the Dragonfly Olympics! What other events do you think they would have? I’m pretty sure they’d have gymnastics, given the frequency with which I see dragonflies do handstands. I love to shoot in the rain. 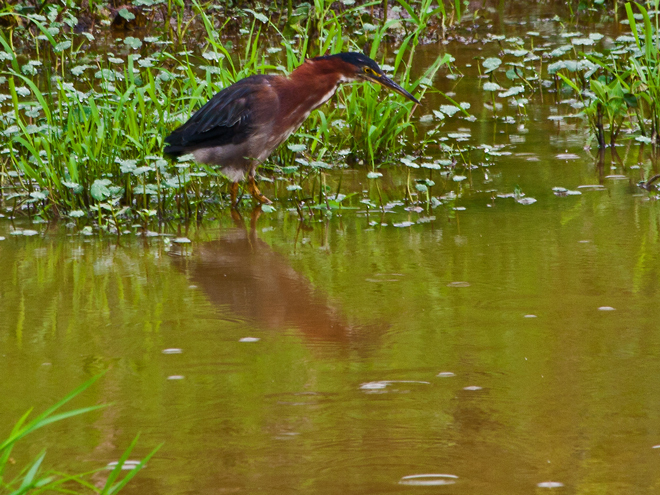 This past weekend the weather was threatening, but I went to Huntley Meadows Park anyway and was happy to see both a Great Blue heron and a green heron. 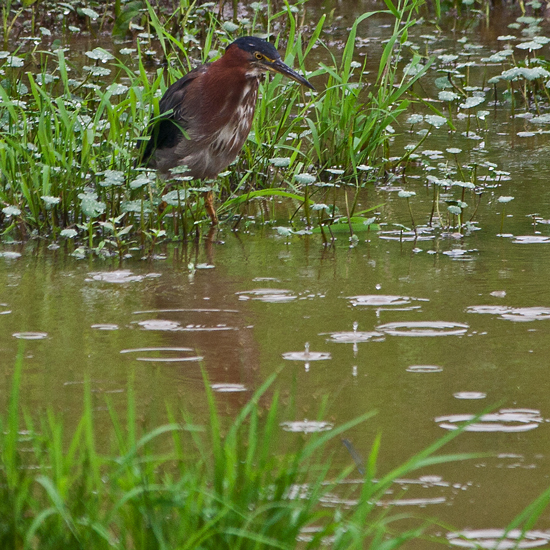 It was already sprinkling a little when I started to take some photos of this little green heron and I had my umbrella out. I like the effect of the raindrops on the surface of the water. 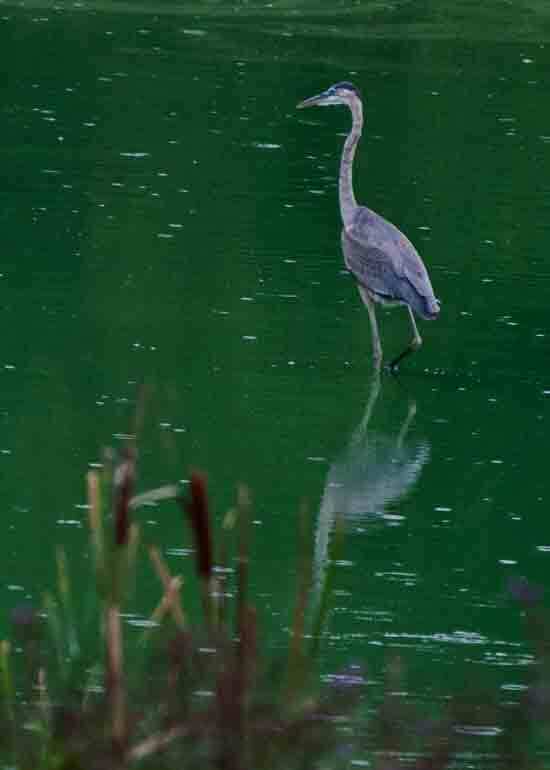 The light was interesting too and the heron cast a reddish, blurry reflection in the water. 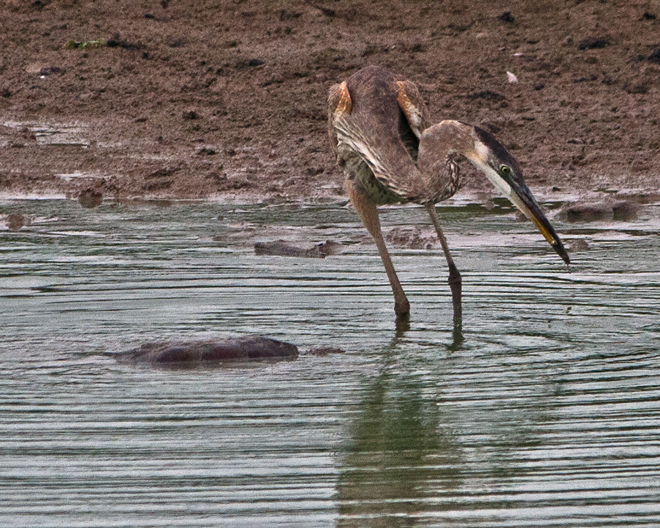 The weather started to worsen as I headed toward the location where I previously had seen a Great Blue heron. That area has a two-tiered observation area and I knew the lower level is partially sheltered from the rain. I arrived just in time as the rain started to come down really hard. 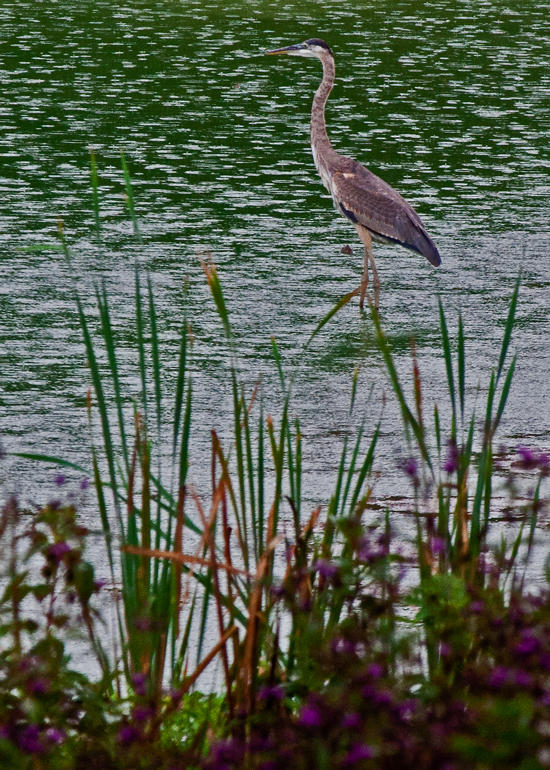 The first photo of the Great Blue heron shows him standing in the water as the rain pours down. It didn’t seem to bother him at all. The quality of the photo is not that great (the light was bad and I upped the ISO), but I like the effect. The second photo shows the same area as the downpour is ending and the water appears as a very vivid green and looks almost tropical. The rain may not be the time to take perfect photos, but I personally like the look that it gives to some of the photos that I shoot. 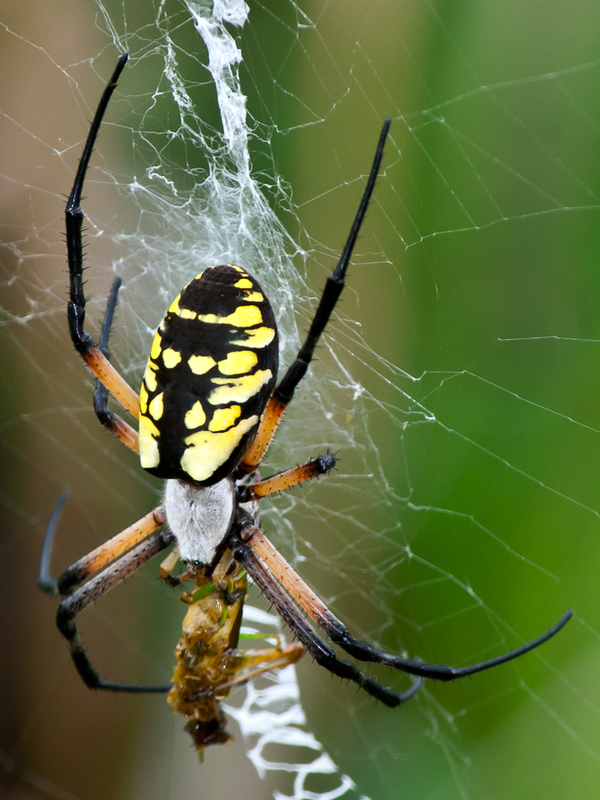 A few days ago I posted a photo of a Yellow Garden Orbweaver (Argiope aurantia) that I photographed at Huntley Meadows Park in Alexandria, VA. I was strangely attracted to those spiders and returned the next day to see if I could get a few more shots. Here is one of my favorite shots from that day. The spider looks to be gnawing on the leg of a grasshopper that has been wrapped up and seems to be a little dried out. The grasshopper actually looks like he has been battered and deep-fried, but that seems to be a bit over the top, even for a Southern spider. You can also see a little of the zigzag pattern of the web at the bottom of the photo that is typical of the webs of this kind of orbweaver. Last week when I was at a local garden I came across several pairs of ladybugs mating and several things really stood out to me. First, the male ladybug is a lot smaller than the female. An article at ladybuglady.com (a great name for a website) points out that females are “usually” larger than males, but essentially it’s almost impossible for the average person to tell them apart until they are mating. 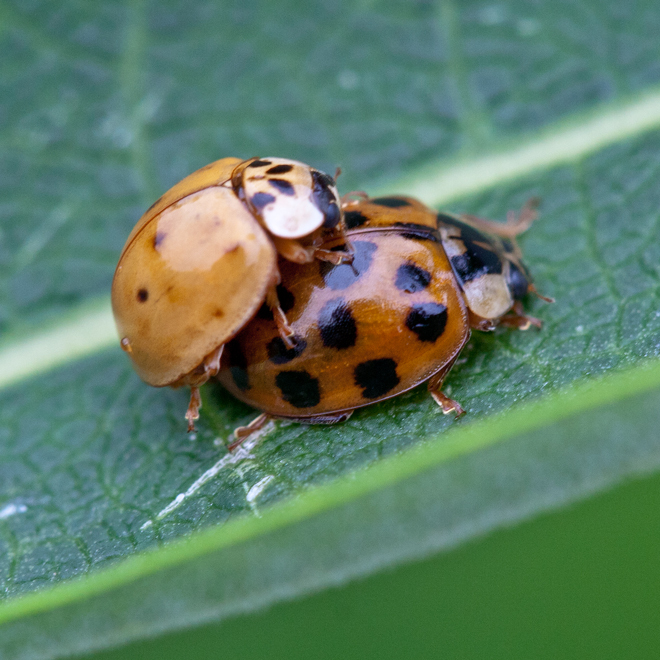 If you really want to know how to tell male ladybugs from females the referenced article has photos from an electron microscope with detailed explanations. The other thing that was obvious was the difference in color and spots between the two. The male is a medium orange with a few small light black spots and the female is a deeper shade of red with larger, darker spots. Wikipedia notes that there are more than 5,000 species of ladybugs (which technically are beetles and not bugs), with more than 450 native to North America. 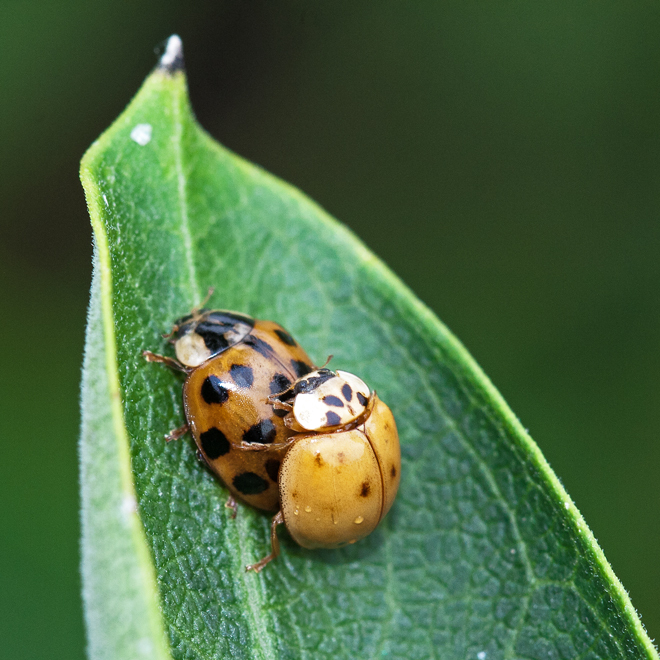 According to that article, the number, shape, and size of the spots is dependent on the species of ladybug. Does that mean these two ladybugs are different species? So I am left wondering, will the little ladybugs that result from this coupling look more like mom or like dad? Usually when I try to photograph this kind of flower I end up focusing on the petals and the stigmata (I think that’s what those five purplish things at the end of the stalk are called) are out of focus. 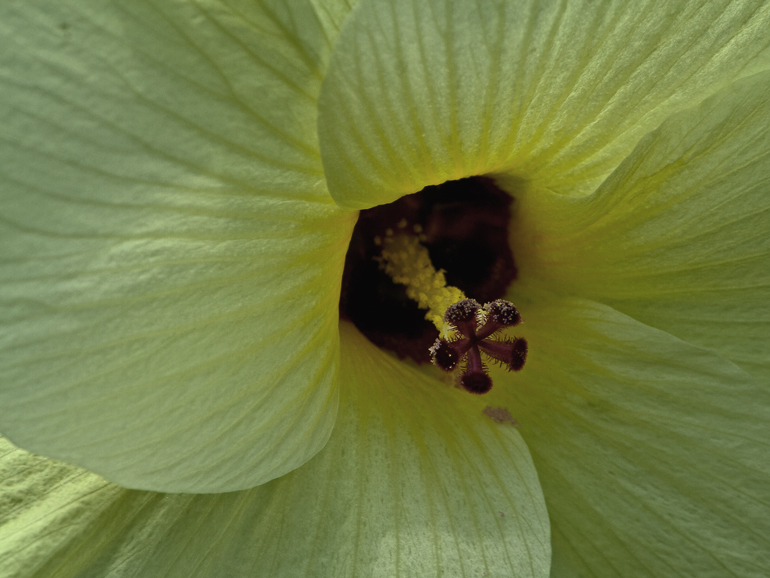 This time I made a concerted effort to have the stigmata in focus and let the rest of the flower—which I am pretty sure is some kind of hibiscus—take care of itself. It seems to have worked out pretty well and as an added bonus the light caused the inside of the flower to glow a little, giving some depth and texture to the petal.